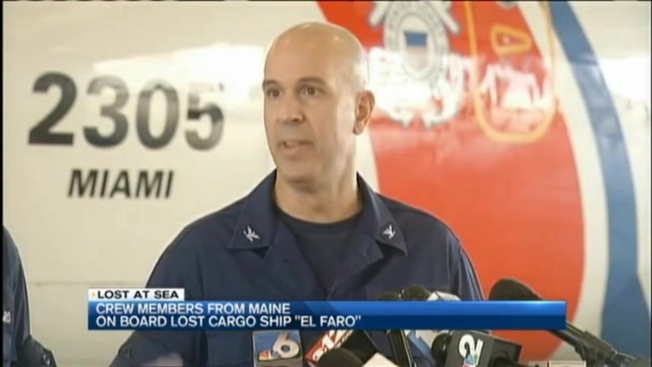 Of the 33 people on board the sunken cargo ship El Faro, four were from Maine, including the captain. Maine Maritime Academy confirmed the four were graduates of the school. They are: Captain Michael Davidson of Windham, Michael Holland of Wilton, Dylan Mecklin of Rockland, and Danielle Randolph of Rockland. The U.S. Coast Guard said Monday that they believe El Faro sunk on Thursday. They have found a life boat and one survival suit and unidentified human remains. Captain Mark Fedor said it's possible crew members abandoned ship and are still alive in the ocean, although conditions are challenging for survival. "We're not going to discount somebody's will to survive, and that's why we're still searching for them," said Captain Fedor. Fedor said it's not known why the El Faro was traveling in the path of a hurricane last week, and ultimately it is the Captain's decision. Friends of Captain Michael Davidson said he is an experienced and "prudent" mariner, with years of training. "He's a very serious and seasoned mariner," said Nick Mavodones, Operations Manager of the Casco Bay Lines. Mavodones is a friend and former co-worker of Davidson. "I continue to hope and pray that they will be able to find survivors," said Mavodones. "I think we shouldn't give up hope." Several family members of the Mainers on El Faro traveled to Jacksonville, Florida to be closer to the search. "It's nothing short of a nightmare," said Deb Roberts, mother of Michael Holland. "You just have to keep hoping until you hear differently," she said. "You have to keep hoping, and praying, and believing in miracles."